The growing demand for therapeutic proteins, especially monoclonal antibodies, increases the need for practical and economical processing techniques. Such techniques evolved rapidly over the last few decades. In this chapter an overview is given of the main biotechnological production systems with a focus on mammalian cultures and a brief description of prokaryotic cell systems, transgenic technology and plant cells, and of the main purification systems with a focus on technologies such as filtration, centrifugation, precipitation and chromatography. 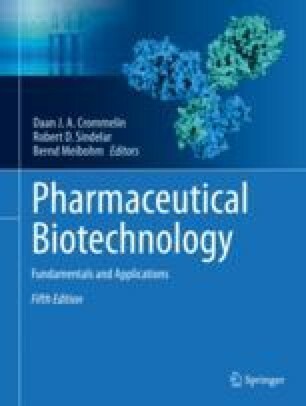 The critical quality attribute concept of biopharmaceuticals is discussed and its relation to the concept of quality by design, as well as strategies to decrease the cost of goods and increase process robustness to ensure consistent and safe production of biopharmaceuticals within large scale manufacturing plants.